Seconds matter in an emergency. Make your emergency team seen. These labels allow you to quickly spot your medical and emergency response team and establish clear lines of authority. From basic hard hat decals to bold, reflective materials, you can find the right label to mark your hard hats, equipment and more. • Pull the team together with this “family” of EMS, paramedic and other title labels. • Spot-a-Hat™ reflective hard hat labels are affordable, yet use a conformable 3M reflective film. Make sure that your team can be spotted at night, in a storm or emergency. 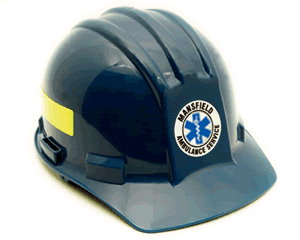 • For even greater protection, order the same reflective strips used for firefighters for their own helmets. These NFPA and other fluorescent labels are brilliantly reflective and make sure that you team can be seen, even under the worst of conditions. A personalized decal makes it easy to manage your team. Remember the name, especially in an emergency. Order a label for each member of your team. These circular labels make fast work of organizing your EMS team. In an emergency it is vital that roles are clearly defined and instantly communicated. Add Company and Individual Names! Just what my Officers needed. Fast ship and great product. Will be purchasing more. Perfect size and gloss to put on the door of every resident in our bldg. We also placed one in the first responder lock to alert them that the occupant has a medical tube in their refrigerator that contains their medical information, doctor's name and numbers, next of kin and prescription medicine types, thereby cutting down time for them. Stickers were easy to apply to the hardhat curved surface. Just as advertised. Thank you! !